HI!!!! Today we recap the super fun event that came to Houston for Spring Into The Future. 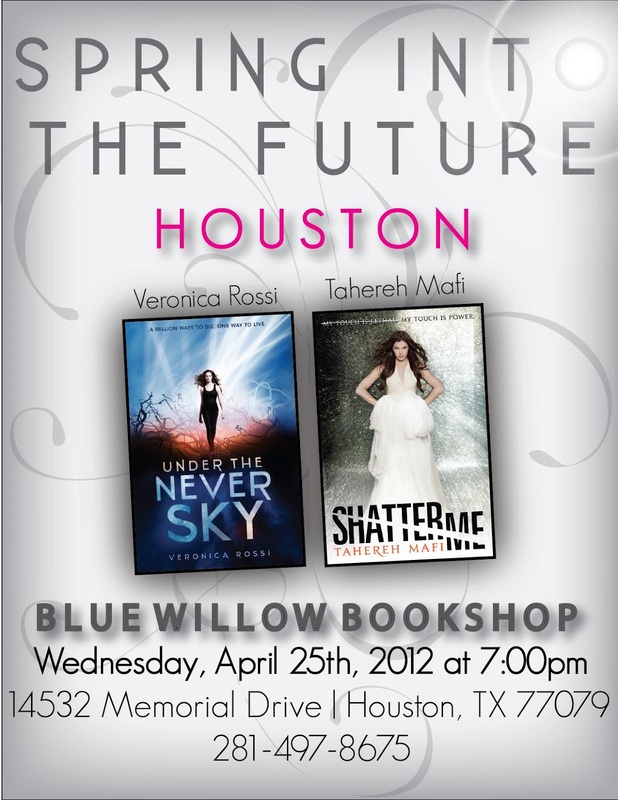 The event was April 25th at Blue Willow Bookshop. 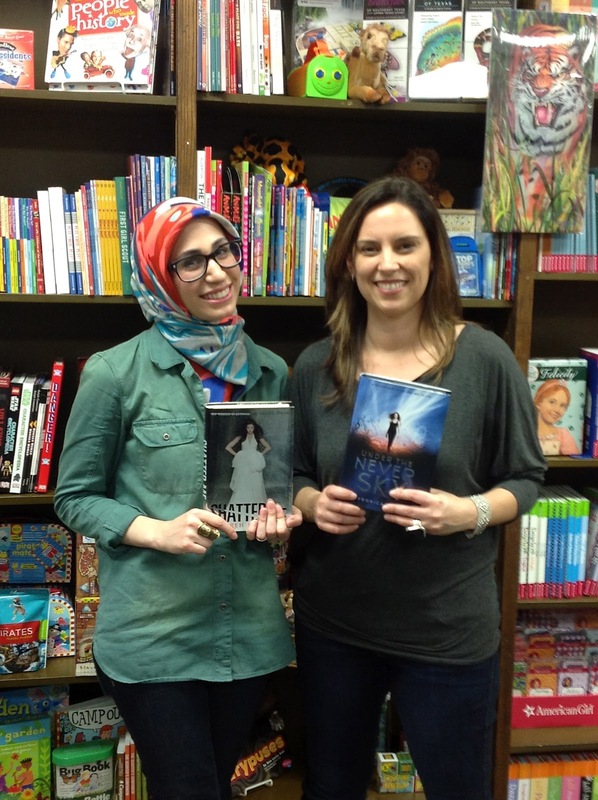 We had authors Taherah Mafi and Veronica Rossi visit. Taherah is the author of Shatter Me and Veronica is the author of Under the Never Sky. Both books are debut books for each authors and are planned trilogies. They were asked what is harder to write the first or sequel? This event was jam packet and so much fun. These lovely authors will crack you up. The crowd had great questions for them and they had great answers right back. They both got to sign the walls of Blue Willow. Here is our impromptu interview that Taherah and Veronica did outside of Blue Willow Bookshop. Enjoy! visiting the official SPRING INTO THE FUTURE Facebook page. download logos and read about all the authors on tour. following: signed books, signed posters, spring totes, ARCs, swag, etc. Thanks for you the giveaway! I wish this tour was visiting somewhere near me! I think a sequel would be more difficult to write; more pressure. I'm not signing up for the giveaway being that I have both books. But I wanted to say I think you did a great job with the interview. looks like so much fun to meet them! hopefully one day i would..
AND thank you for the terrific giveaway! Looks like you had a blast at Blue Willow. Shatter Me is great but I haven't had a chance to read Under the Never Sky yet. Sounds really good though. it looks like this was a lot of fun! We never have any tours near me. All of our bookstores closed down. We only had Borders and a long time ago Walden books. I love these giveaways. Looks like it was fun! Thanks for the chance! I loved both of these books!!! I would love to win them :)!!!! That must have been a lot of fun! Thanks for the chance to win! Ohhhhh... this is an amazing giveaway! Thanks sooo much :) I've read Shatter Me cuz I borrowed it and I would love a copy! And I've heard so much about the Never Sky! Thanks for the giveaway! The event sounds like so much fun! I've never had the opportunity to meet any authors - it would be awesome!! I wonder if having a deadline takes away from writing the story if you have to get it in in time?? The authors looked so animated in the video, cute! Looks like a fabulous event! Thanks for sharing, I would really like to go to one of their signings, they seem so nice. I think you spelled Tahereh's twitter handle wrong, it's not linking back. thanks for sharing your experience with us and for the chance to win! I have never been able to attend a signing, thanks for sharing and the giveaway! Looks like it was a lot of fun! I would love to meet both of these authors! Thanks for sharing your experience with the signing - never been to one, seems fun and interesting! I always love to meet the people behind the creations, be it books, crafts, etc. It's always fun to see if your idea of them comes at all close to how they really are. It sounded like a fun event. I've always wanted to attend a signing... someday. Thank you for the giveaway! That looks like such a fun event, I wish I could have went! Thanks for the giveaway! I want to meet these two too!!! Thanks for the giveaway! You are so lucky, all the best tours stop in your area. Thanks for sharing the book love with those of us who don't get to meet them. I wish the tour was somewhere near me! I've never been to one, so this would have been a cool one to start with. I'm with Leeanna-I wish a tour would come to a place near me! Aww I was so sad hat I couldnt make it! Sounds like fun. I wish I could've been there. Also, I hope they found Veronica's luggage! I'm jealous. Hardly anyone ever comes to my part of the country. Have fun and thanks for the giveaway. So jealous! I would love to have been able to go any of the stops! Thanks for the giveaway!!!! Good luck everybody!!! Thanks for the awesome giveaway. These 2 books are ones that I really have looked forward to reading but haven't gotten yet. It would be so wonderful to win them. Tahereh's twitter doesn't work so I couldn't follow it, but I would if I could. Yay! You guyus really do know how to spoil your followers. Thanks for the giveaway! XD They look so good!